The TwitterPeek is... a Peek for Twitter? 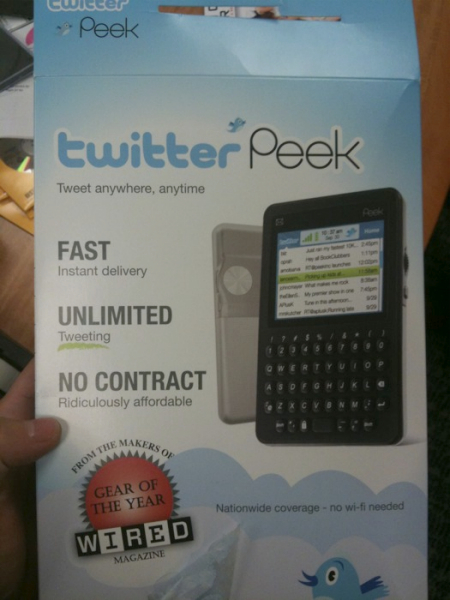 Peek's never been one to shy away from the wacky and opportunistic marketing schemes but launching a whole product just for Twitter? That's courage, drive, and possibly a mental health issue. Yet here's the TwitterPeek -- what looks to be the same old Peek you know, love, and probably haven't purchased, stripped of its email and SMS functionality and re-oriented towards telling the entire world too much about your body and what you're doing to it every waking moment of the day. Now, to be fair, we're getting a distinctly strange feeling of phoniness about this whole thing, but there's already an Amazon listing and a picture of the box has already surfaced on -- where else? -- Twitter, so this could really be happening. Just think about that for a second. And then tweet about it, of course.